Very cool setup. GM had stations set up with various car classes so in the Chevy Sedan area you would have the Cruze, Fusion, Civic, Malibu, Corolla and you could drive each one around a small cone track in the parking lot of the Santa Anita racetrack. There were about 5 stations total so you had the Compact Sedans, Luxury Sedans, SUV and Trucks, Performance/Sports and the Volt each separated out. My first stop was the compact Sedans because GM was making you drive the Cruze first before allowing you to drive the Volt. 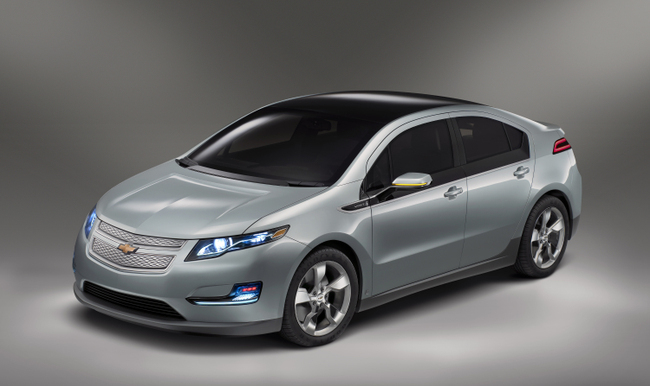 It seems like GM is using the Volt as a gateway car to get people into the car that is readily available to buy. I get it, the Volt is a unique product and limited so why not use it to expose people to the “new” GM. It worked for me. I like the the Cruze at the LA Auto Show and driving it didn’t change that. If I wasn’t dead set at my next car having some type of electric engine I would put the Cruze on my short list. We immediately headed over to the Volt area to stand in line now that my prerequisite was done Chevy had a Volt sitting open that you could sit in and manhandle. A rep was there to talk about all of the selling features. At this point I just wanted to drive it so we stood in line and awaited our turn. I listened in as the rep talked to people in line about the car. No new earth shattering information is coming out but it was a good way to pass the time. It looks like they have about 5 cars cycling in and out. It probably takes us 15 minutes to get to the front of the line. We get into the car and our GM Rep goes over the basics. Our car is running on battery at this point so we smoothly accelerate off onto the course. The Volt track ventures out past the event parking and about half way through the car started chirping at me. It appears that in all of the excitement I forgot to put on my seatbelt. You think you are so smart Volt… we will see… we will see. A quick click and the rest of the drive was incident free. The track was really short, the whole drive must have lasted 3-4 minutes. At least there was one small segment that let you floor the accelerator to get a feel for the torque.